This is an interesting concept CD put together by Timo Lommatzsch and Sven Missullis out of Hannover. The music is supposed to be soundtrack music to a B Sci Fi movie. We have ambient strange noise music and also upbeat rocking stuff as well. The CD is coded though so it is not so easy to always figure out who is playing what track as some symbols appear multiple times. Anyway, Colour Haze open the CD with what I think is one of their best songs ever. The price of the compilation is worth it for this song alone. Colour Haze's first trip into space rock territory and a big success. Sula Bassana is next with a strange 30 seconds of space. Now I get confused as the symbol for On Trial is listed on tracks 3 and 4 and it is not them but there are other symbols as well. This is probably Funkster t-xc9 missullis. More Strangeness is up with Timo and e-stonji. Track 8 is a very interesting song by On Trial, unlike anything they have ever done before. It is very spacey and mysterious and freefloating. Wow. They are followed by Vibravoid with a very strange track. The Electric Pimp track is fun and strange and leads into Cactus Copper. Liquid Sound Company provide a very cool repetitive sitar like space rock song. Excellent stuff. Alla X. Navarro de la Paz has a beautiful song. Sula Bassana takes us on a nice deep space journey again as well. Ul7 closes the CD with some space electronic techno magic. If you want to hear some weird and strange songs performed by bands you know and love then check out the compilation. Most of it is pretty strange and experimental space music and Colour Haze provide one of the only real songs on the CD but it is awesome! 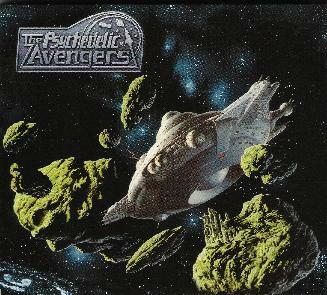 For more information you can visit the Psychedelic Avengers web site at: http://www.psychedelicavengers.de.vu. Visit the Fünfundvierzig web site at: http://www.fuenfundvierzig.com.